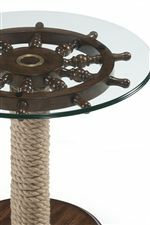 Accent your home with this maritime inspired round end table, crafted from hardwood solids and oak veneers with a Dark Oak finish and a 12 mm thick tempered glass top. 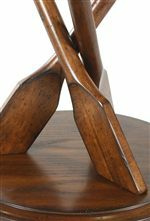 The table base consists of three miniature oars, carved to scale and positioned atop a bevel edged platform and three turned feet. Pair this table with other occasional pieces from the Beaufort collection for a coordinated room setting. The Beaufort Round End Table with Three-Oar Pedestal and Tempered Glass Top by Magnussen Home at AHFA in the area. Product availability may vary. Contact us for the most current availability on this product. T2214-05B Round End Table Base 1 20" 20" 24"
T2214-05T Round End Table Top 1 23" 23" 0.393"